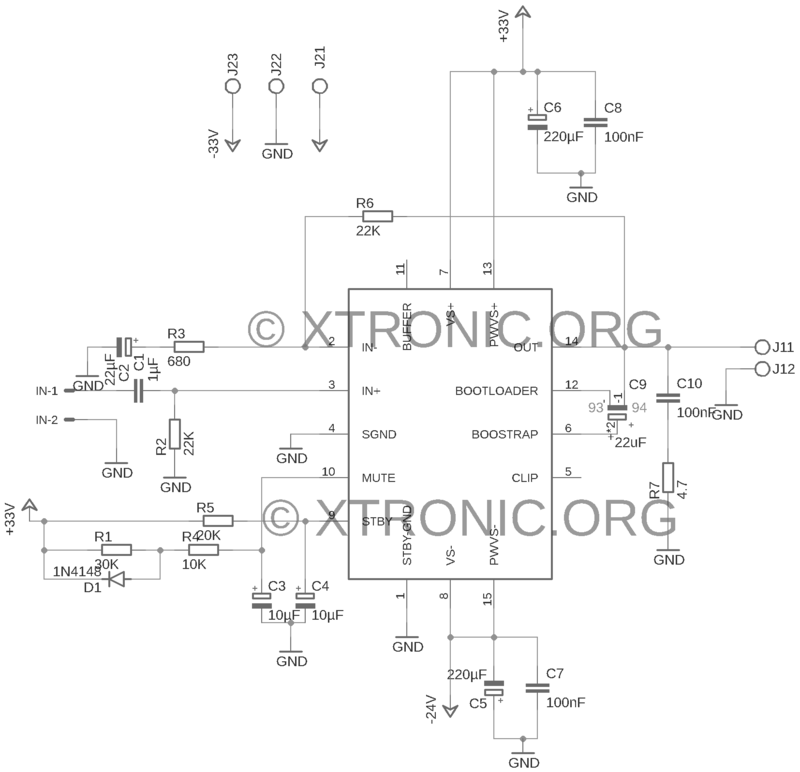 Audio power amplifier project based in integrate circuit TDA7294 or TDA7293. 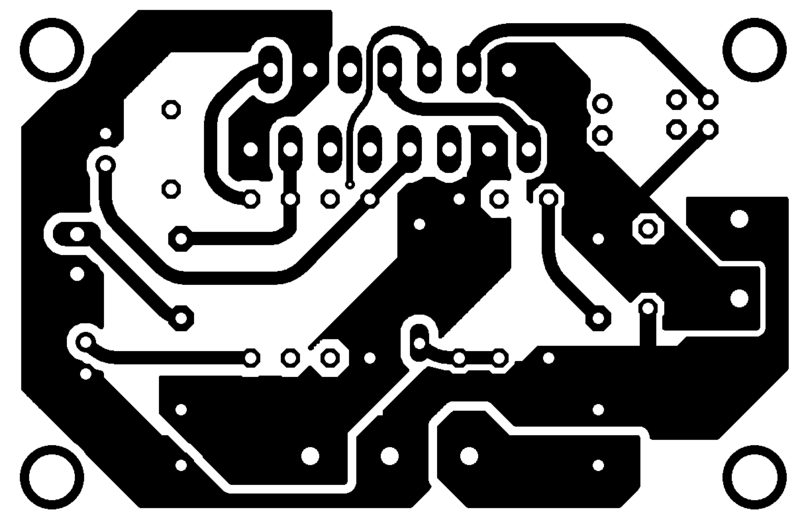 Compact printed circuit board and is ideal to be used where a compact amplifier and with adequate power to be used in various applications, such as computer amplifier necessary, games, Mp3 Player, Home Theater, Sound environment, amplified Cash, etc. To assemble with TDA7294 or TDA7293 just by changing the position of a capacitor. Output Impedance: 4 at 16 Ohms. The transformer is connected at the power supply should be able to provide power equivalent to 1.4X the amplifier power. This power is on the DC voltage used. In the chart below we can see what will be the maximum power, by matching Po(W) and Vs(+/-). Eg: for 25V => 60W and 30V => 83 Watts. This when connected to speakers of 4 Ohms. This THD to 0.5%. 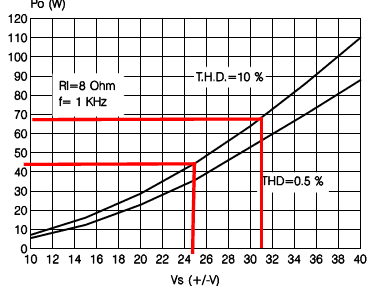 Note that for 4 Ohms the maximum is +/- 30VDC for TDA7294. 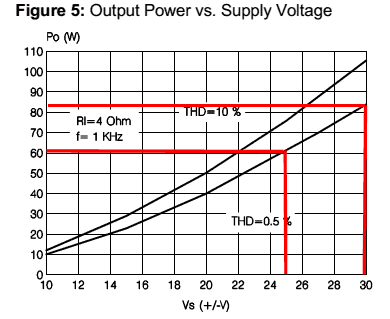 Below is the chart to TDA7294 linked into 8 Ohms – The power supply can be up until +-36VDC. With this value at hand just go on the chart and find what will power for this case! 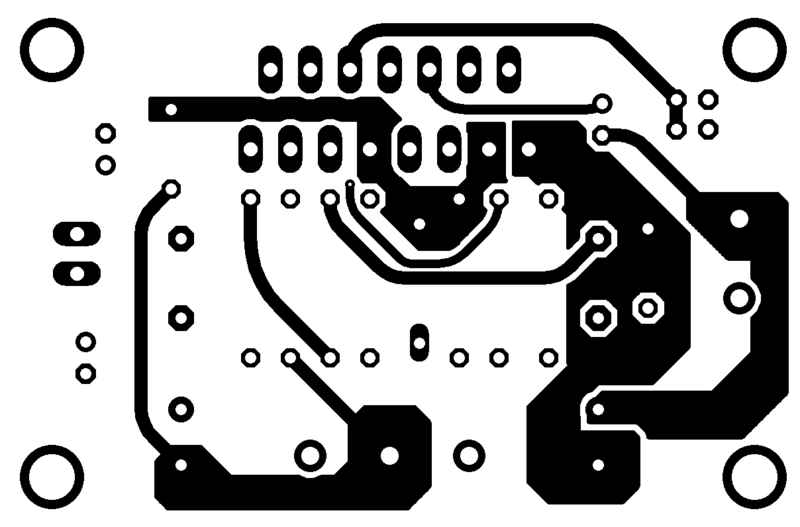 Notice the layout how to assemble the capacitor properly for TDA7294 or TDa7293. C7, C8 100nF/100V – Ceramic capacitor or polyester. C10 100nF/63V – Ceramic capacitor or polyester. IC1 TDA7293 or TDA7294* -Audio amplifier integrated circuit. Welding, Wires, PCB, box,power supply 18 a 36 Volts DC /2,5 Amperes, etc. A quick note on C9. C9 must be configure correctly for the IC you are using. If a TDA7294 then C9 must be connected ONLY from pin 14 to pin 6 of the IC. For compatibility purpose with the previous devices of the family, the boostrap capacitor can be connected both between the bootstrap pin (6) and the output pin (14) or between the boostrap pin (6) and the bootstrap loader pin (12). When the bootcap is connected between pin 6 and 14, the maximum supply voltage in presence of output signal is limited to 100V, due the bootstrap capacitor overvoltage. 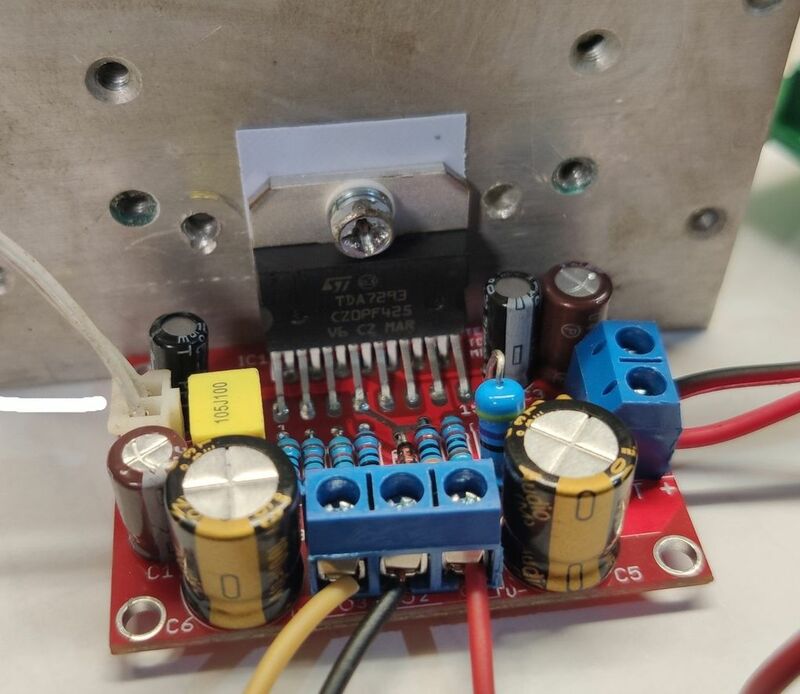 When the bootcap is connected between pins 6 and 12 the maximum supply voltage extend to the full voltage that the technology can stand: 120V. This is accomplished by the clamp introduced at the bootstrap loader pin (12): this pin follows the output voltage up to 100V and remains clamped at 100V for higher output voltages. This feature lets the output voltage swing up to a gate-source voltage from the positive supply (VS -3 to 6V). So you have the option, EITHER pin 14, or pin 12, BUT NOT BOTH! IMO, the drawing is correct in trying to show both options, however the write-up fails to indicate well that it is an option depending on which IC you are using. Thanks for the remark, really 93 and 94 was discreet! Hi I assembled this Mono amp but when I supply 12 volts 1 amp power I get a loud human only. Can you help me put this to work. What type of capacitor C9 is? with three legs? I bought this circuit board on E.Bay and assembled it but it doesn’t work. I am getting only a hum in the speakers. I am not sure about C9 capacitor so I coupled 2 capacitors. Can you help me to find te fault on it. 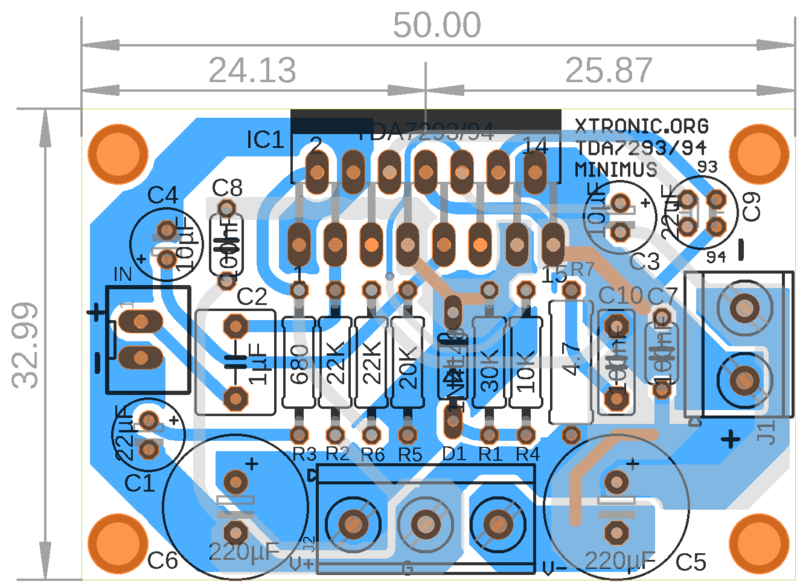 We have a project of a stellar LM3886 High-end DC-servo amplifier complete with Sprint-Layout and schematic/pictures, check it out.